Canada's 2nd Annual Expo promoting the respectable and responsible use of marijuana as medicine. North Building, Hall A. June 3 - 5, 2011. Note: These special rates are only available on rooms booked by May 5, 2011. Rate: $189.00 plus taxes for King Room. 416-343-1234 (Local) Web: Click Here. 60 York Street Toronto, ON. Located just 5 minutes form the MTCC. Refer to Treating Yourself Show Rate. This will take you to the Reservations Page for the hotel. 5.Choose desired room category, and number of people in your party. 6.Click on "Continue reservation". You are now ready to complete your reservation! Canada's #1 trade show and convention facility – at the center of Toronto. 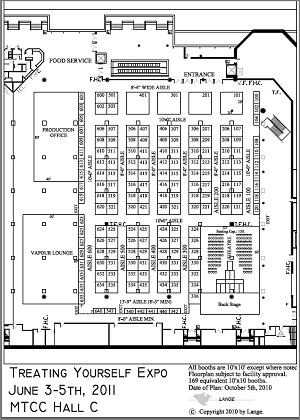 Our venue has over 600,000 square feet of exhibit and meeting space including 64 meeting rooms, a world-class 1,330-seat theatre and two well-appointed ballrooms. We've been host to events and conferences as large as the International Aids Conference, to the renowned Canadian International Auto Show, and as intimate as private sales meetings. The dedicated staff, technologically advanced facilities and enviable reputation for food and service excellence help to make each event we host a truly unique experience for groups of 40 to 40,000. The Metro Toronto Convention Centre is located in the heart of vibrant downtown Toronto, a thriving multicultural mosaic. We’re within walking distance of the waterfront, 12,000 plus hotel rooms, and fine shopping, restaurants and attractions. The city’s business, financial, fashion and cultural districts are minutes from our doorstep. Plus, we’re only a 20-minute drive from Pearson International Airport. Whether you’re an event planner, an exhibitor or an attendee seeking further information about the Metro Toronto Convention Centre, you’ll find everything you need to know right here online – and quickly! For a personal touch, our team is just a phone call or email away. The Metro Toronto Convention Centre. Inviting, inspiring, innovative, incomparable. We’re your partner in creating memorable events.